As some of you may know I have been collecting the early Between the Pipes sets! 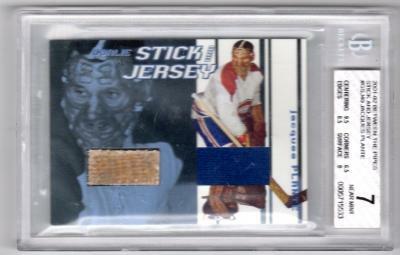 Other then the HSHS redemptions I am one card away from completing the 02-03 set which is the Roman Turek autograph card! The 01-02 set I was missing 3 up until today! 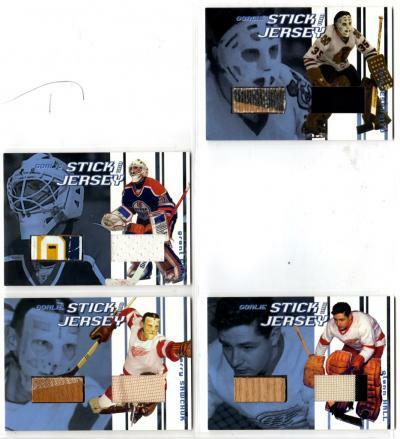 The three were the All-Star Jersey of Olaf Kolzig and Stick and Jersey cards of Bernie Parent and Jacque Plante! Well the Plante arrived today so I am just down to the two remaining cards! 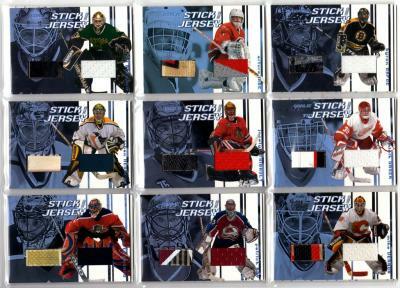 Here is what I have so far in the Stick and Jersey set! Well done on this gorgeous set! That Plante... awesome. That is one nice collection. Shock and awe I say! Yours has to be one astounding office or games room full of showcases with your collection. It would be one heck of a room to visit.